VeriCite DocumentationUser GuidesVeriCite Help VeriCite LTI Instructor HelpHow do I delete a VeriCite LTI assignment? 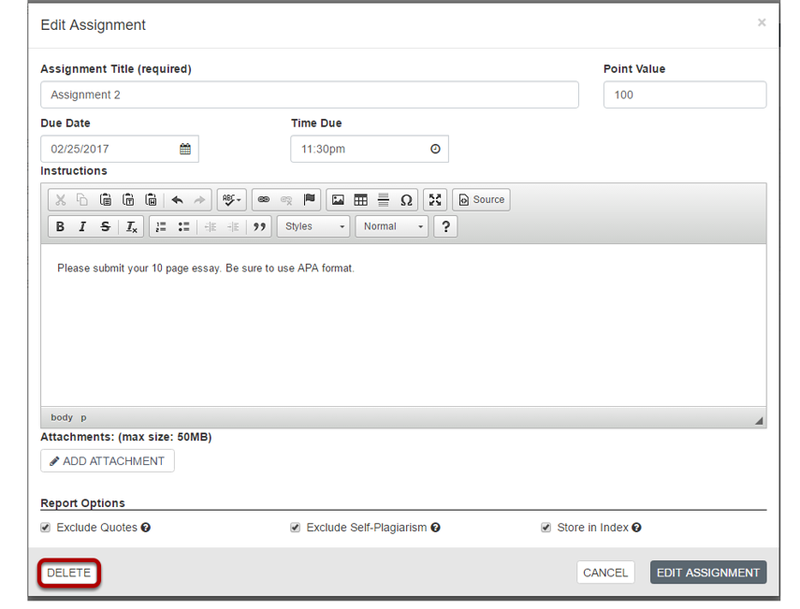 From the Assignments screen, locate the assignment you want to delete. Zoom: From the Assignments screen, locate the assignment you want to delete. Note: Deleting an assignment that has student submissions will cause those submissions to become orphaned. You can recover orphaned submissions from the Assignments listing page under Assignment Defaults. Prev: How do I sort the VeriCite LTI assignment list? Next: How do I recover orphaned VeriCite LTI assignment submissions?